Everyday, there are special achievements and newsworthy headlines happening at the School of Dentistry. In effort to give proper acknowledgement and share these successes, please tune in for the monthly Dean’s High 5 as we acknowledge those responsible for the top 5 stories happening at Detroit Mercy Dental. Congratulations on your hard work – you make Detroit Mercy the place to lead and learn. 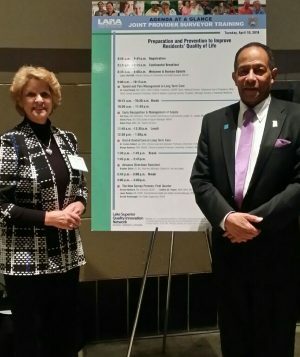 On Tuesday, April 10, in Lansing Mich., Curles Colbert, Jr., D.D.S, Clinical Lead, assistant professor, and Marge Buehner, R.D.H., M.H.S.A., clinical associate professor, presented at the Michigan Department of Licensing and Regulatory Affair’s Joint Provider Surveyor Training. Almost 600 nursing home staff and Bureau of Community and Health Systems surveyors were enlightened with the presentation titled “Oral and Dental Care in Long-term Care Facilities.” As a result, Buehner and Colbert were invited to attend statewide best practice organization meetings. 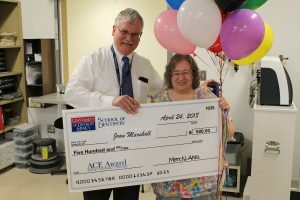 Congratulations to the most recent recipient of the School of Dentistry ACE Award, Ms. Joan Marshall. Joan works for the School of Dentistry as a materials management assistant. She contributes to the team effort of servicing the students and staff and maintains a positive attitude while doing so. Prior to joining Detroit Mercy, Joan had no dental experience, but her strong determination and handy notes paid off. The ACE Award program recognizes School of Dentistry staff members who consistently demonstrate commitment to the University of Detroit Mercy values and standards of service, and is designed to acknowledge the exceptional employee. 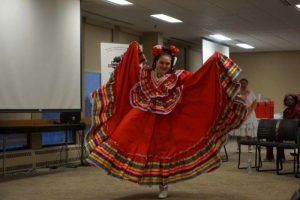 The 2018 Taste of Diversity, held on April 18, was a colorful event to celebrate the various cultures and backgrounds that comprise the Detroit Mercy Dental family. The tastes and entertainment touched upon a world of cultures. A unique menu included various flavors ranging from tamales and samosas, to Bahamian beans and rice, and jerk chicken. Performances included Mexican ballet dancers, steppers from various Greek organizations, African dancers and drummers, and spoken word. Many thanks to SNDA for hosting this event and encouraging respect and reverence for the differences that make each of us who we are. Full recap here. During the first month of his dental education in September 2015, Michael Herman suffered the devastating loss of his brother who overdosed on heroin at the young age of 27. 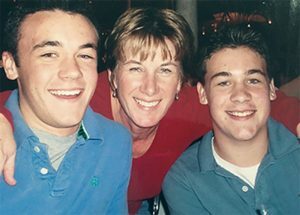 Michael, now a third-year dental student, and his mother were recently highlighted in an interview with the American Dental Association, serving as activists to change prescribing habits and give a voice to people suffering from addiction. We are proud and inspired by his family’s drive to create change. Click to read the full article.